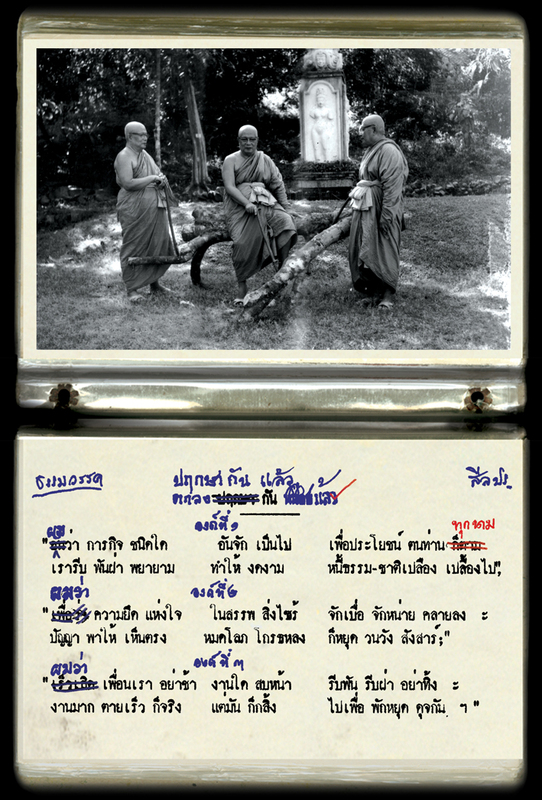 By 1972, Buddhadasa Bhiku had already attained the age of 66 and the stature of a famous enlightened monk; he struggled to reject all attempts to turn his portraits into icons of superstitious worship, which at that time (as now) was all the craze. 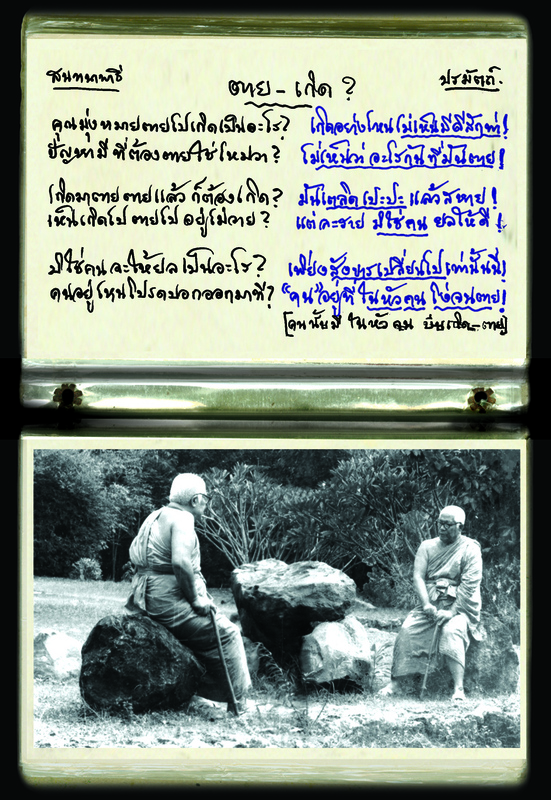 He wanted people to realise the essence of Buddhism; not to cling to the egoism of ‘I’ and ‘Mine’. 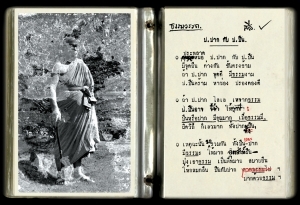 When he finally saw that his fight against the holy picture craze was futile, Buddhadasa embarked on a series of self-portraits, using the environs of Suan Mokh Monastery (Surajthani) as location, with all its scattered symbolic props: a statue of Bodhisattava Sri Vijaya, lotus flowers, mounds of dirt, a flat rock, even monastery pets. 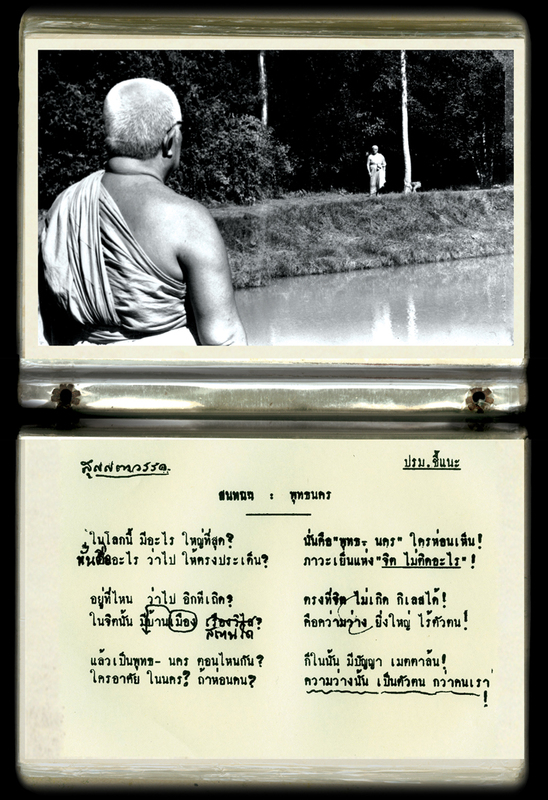 At times he’s posing alone, employing tricks in the monastery darkroom to compose double and triple prints to create a dharma riddle, inviting the viewer to interpret with wisdom. 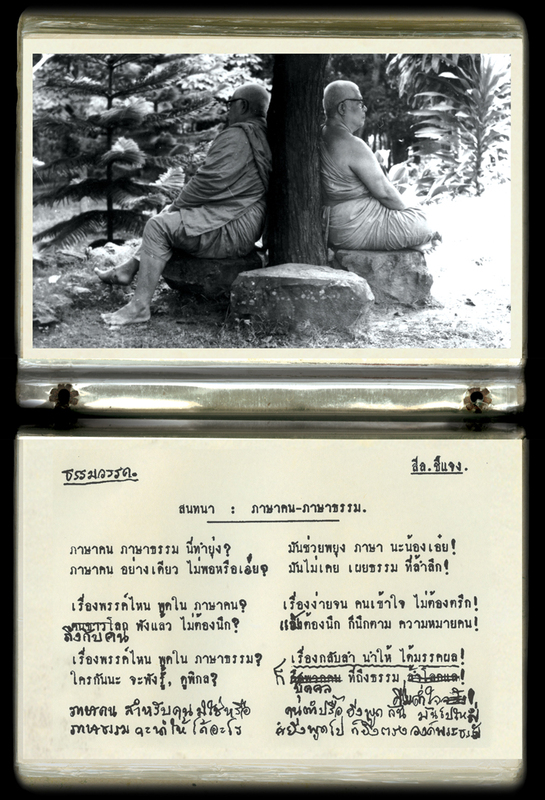 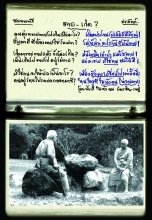 Each picture was accompanied by a dharma-teaching poem that he’d written for it. The series is entitled ‘Dharma Text Next to Image’. 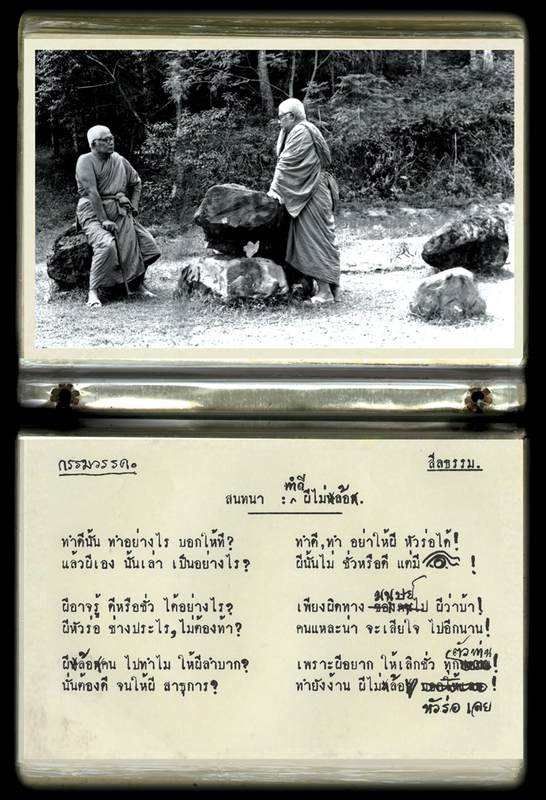 These 423 Buddhist poems and photographs clearly reveal Than Buddhadasa’s understanding of art and technology, particularly the potential power of photography to serve as a medium for spreading dharma—a visionary idea far ahead of his time, when the Thai art world still had no inkling of such terms as ‘Conceptual Art’ and ‘Conceptual Photography’. 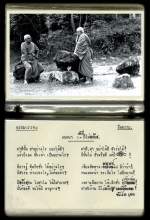 Kathmandu Photo Gallery, with cooperation of Buddhadasa Indapanno Archives, is honoured to present the photography of Buddhadasa Bhiku (1906 – 1993): thirty images printed and enlarged from the original artwork for ‘Dharma Text Next to Image’, to celebrate a photographic master, as the sixth edition of our ‘Seeking Forgotten Thai Photographers’ project to search for master artists otherwise neglected by Thai photographic history.